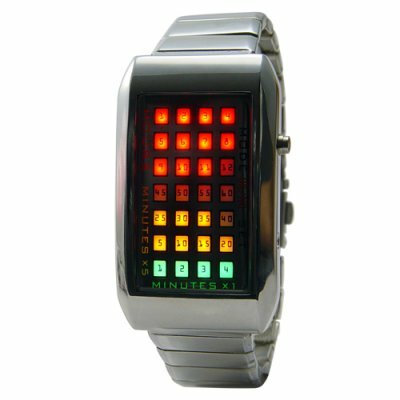 Successfully Added The Continuum - Japanese Style Multicolor LED Watch to your Shopping Cart. Introducing The Continuum, a red, yellow, and green LED watch from the future which manifests the nucleus of cool by reinventing how we tell time. You mean this watch really tells the time? Yes. Even though The Continuum symbolizes herculean style and front-trend design with its hypnotic red, yellow, and green LEDs encased in argentum hues (like colliding subatomic particles in a swirling soup of primordial matter), this Japanese LED watch does in fact tell the time and does so really efficiently too! Tap the display button on the right side of the timepiece and watch the screen light up. The red squares represent hours. The yellow squares represent 5 minute intervals and the green lights represent 1 minute intervals. It's not 1:16pm! It's red, yellow, yellow, yellow, green pm! How's that for grand unified awesomeness? Alluring to behold you must be careful though. When you look into this watch, this watch also looks into you! Of course you needn't be Dr. Who or a Starship Captain who was assimilated by the Borg to wear this watch. In fact this watch is perfect for your average geneticist, botnet herder, Firefly fan, uber geek, Hugo award winner, or anybody who is a somebody. Press the top button to display the time on demand or else the watch will by default automatically flash the time every 6-10 minutes (this feature can be turned off). How do I change the time, date, day of the week, and luminosity on this watch? The batteries should last longer than with a normal watch since time and date information is only displayed when you want or every 5 minutes. Why is this watch called The Continuum? This is a little difficult to explain. It helps if you wikipedia "The Q Continuum". Basically the Q from Star Trek are extremely powerful, hyper-intelligent beings. Sort of whom we envision this watch would be perfect for. You mentioned that this watch is perfect for your average geneticist, botnet herder, Firefly fan, uber geek, and Hugo award winner. What if I don't belong to one of these groups? This watch is also perfect for Neuromancers, Deviant Artists, Tragicially Hip fans, CSS gangsta coders, Bob Marleys fans, Starcraft players, and manga lovers. on 2010-05-30 06:49:16 Awesome effects! I got my watch 6 days after I ordered it, and I live in Norway. What I love about this watch is that unlike the other LED watches I've bought, is that this watch has different animations. The Zero Kelvin watch for example has only got one animation, and the Iron Samurai hasn't even got one! The effects the animations give is just really really awesome, and my friends LOVE this watch!!! on 2009-12-27 21:01:31 Beautiful, Eye Catching , Captivating Watch. Me ha sorprendido la calidad del reloj a pesar del precio. Buenos acabados. Metal. Compra muy buena. Solo 3 dias a España. Reloj con estilo y elegancia.